Jock Lindsay’s Hangar Bar is filled with wonderful bits of history, from tales of aeronautical flights of daring, to archeological finds, and a ton of nods to Jock’s friend Henry Jones Jr. 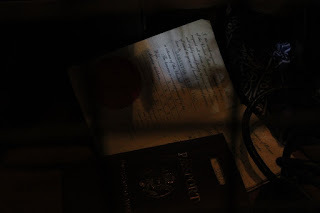 However, one of my favorite hidden details comes from the lost and found and is the passport of none other than Samantha Sterling. It just goes to show, the Adventurers Club may be gone these nine years, but it has certainly not been forgotten. Some of you may be asking yourself who is Samantha Sterling. Let’s provide a little background. Samantha Sterling was the daring adventuress who headlined the show stopping cabaret at the Adventurers Club. It is said that stop a man in his tracks by just a glint in her eye and a beast in his tracks with a dart from her blowgun. The character was dressed in the best safari gear and was based upon Amelia Earhart, which makes it easy to see why she and Jock would have been friends. Why is this date so interesting? A couple of reasons, for starters it is a mere week before guests visited the Adventurers Club. As guests, the story you were told is that you were visiting the club on the night of a recruitment drive, which also happened to be New Year’s Eve 1937. It’s likely that this is not Sterling’s first passport, as she regaled guests with many a tale of her expeditions, but seeing as how it was issued so close to when guests were visiting the Adventurers Club, it’s no wonder that she hadn’t headed back out on a new trek yet. We know that Jock was a member of the Society of Explorers and Adventurers, along with many personalities scattered throughout Disney resorts worldwide, and that the S.E.A. was founded after the Adventurers Club, so it isn’t any wonder that membership would have its overlaps, quite possibly including Samantha Sterling. Either way, their free spiritedness would have made the two fast friends. It does make me wonder what other adventurers this pair got into though.